Leading air traffic services provider NATS has won an Excellence Award in the Cloud Innovation category in the SAP (UK) Quality Awards 2014. The award was given for NATS’ implementation of an innovative mobile solution to assist the growth strategy of its global sales teams. Replacing its previous Customer Relationship Management (CRM) system, the new platform allows for real time reporting and empowers NATS teams to engage with their colleagues and managers through an interactive dashboard and mobile collaborative electronic discussions on account management and lead generation. The award was given to NATS, who partnered with Capgemini on the project, in recognition of the success of the new system, which has already delivered significant results. In particular, SAP acknowledged the contribution of a pilot programme to the overall success of the implementation and an accelerated design thinking process, which helped to mitigate significant risk as the programme was rolled out across the company. The award winning team from left to right: Shin Sawhney from Capgemini and Trish Griffiths, Marie Thomas and Jason Jarvis from NATS. Winning this award means that NATS is now automatically entered into the SAP EMEA Quality Awards. Cormac Watters, Managing Director of SAP UK & Ireland, said: “NATS was able to clearly showcase the quality processes they put into place during the planning and implementation phases. These specific measures greatly improved reporting time, allowing for closer team engagement. This implementation resulted in real business value for NATS and I would like to extend my congratulations to them on this well-deserved win”. 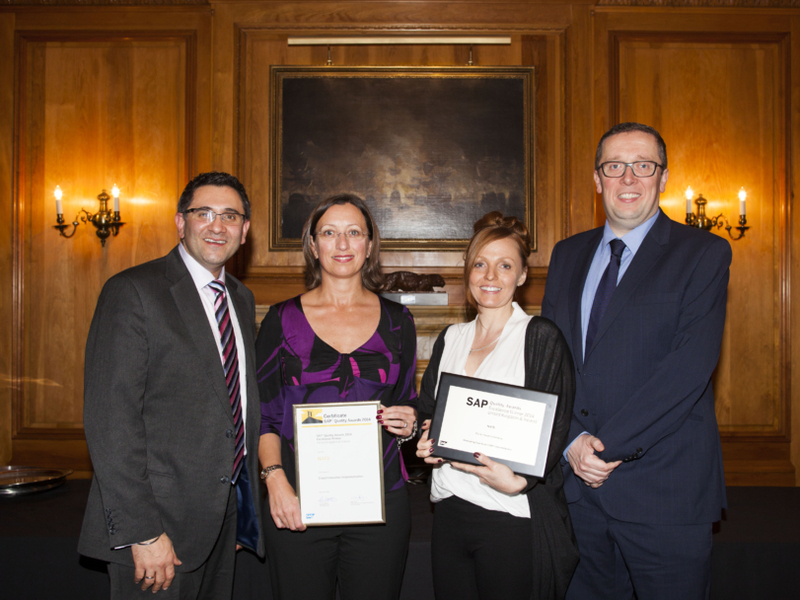 Each year, SAP (UK) Limited presents awards to recognise customers who have achieved excellence in planning and executing their SAP projects, delivering significant business value to their respective organisations. The judging panel was made up of representatives from SAP, past winners and external experts who judged against strict criteria including adherence to SAP’s Ten Quality Principles, demonstration of time-to-value and a focus on how quality excellence was achieved through the entire implementation cycle.